A gluten-free diet, as you might expect, is a diet that excludes gluten, which is a protein composite found in grains such as wheat, barley and rye. Is your eye being drawn more to those gluten free labels these days? If so, you are not alone. The demand for a gluten free diet has generated a craze for gluten-free menus and products at a global scale. But, what exactly is a gluten-free diet? A gluten-free diet, as you might expect, is a diet that excludes gluten, which is a protein composite found in grains such as wheat, barley and rye. This diet is a primary solution for individuals who suffer from celiac disease, a condition in which the small intestine is hypersensitive to gluten and has difficulty digesting foods that contain it. The diet also proves helpful for individuals who have a wheat allergy, which occurs when the wheat- specific antibody IgE reacts to the consumption of gluten. While there are many products in the market that are gluten-free, living a gluten free diet is a significant lifestyle change, especially when dining out. It often means avoiding flavorful dishes and many staple foods as pastas, crackers, bread, baked goods, sauces, dressings, and more. With the demand for gluten free foods comes the opportunity for new flavors that provide the health benefits people are looking for without sacrificing flavor and variety. 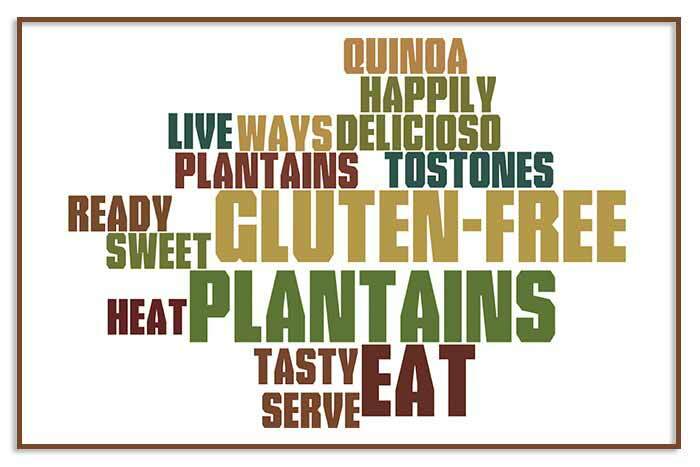 For one, the native foods of the Caribbean offer versatile, naturally gluten-free alternatives. That’s because wheat and other foods containing gluten are for the most part not native of the Americas. Plantains: A starchy fruit that looks like a big banana, but eaten like a vegetable. When cooked green, plantains can be made into tostones and when cooked ripe they caramelize and offer a naturally sweet flavor. Yuca: (cassava/manioc) Another versatile vegetable. It’s rich in calcium and vitamins and is a wonderful substitute for fries, wedges and mash potatoes. In fact, yuca is so versatile that it can also be used as a thickening agent or as a primary ingredient in soups and desserts such as tapioca pudding. Boniato: Depending on the part of the world that you live in, boniato is also known as a batata and yellow or white sweet potato. Boniato provides a milder sweetness than the traditional sweet potato. Perfect as a side dish or main ingredient in soup recipes. Beans: Beans are rich in fiber, protein, antioxidants and B vitamins. In addition, depending on how you cook them, they are low in fat and calories. At times beans can processed in facilities where the supplier may make products with wheat, but look for the brands that are processed in wheat-free facilities. Quinoa: A non-glutinous grain commonly consumed in Peru and now popular in Mexico and the US. It’s part of the “superfoods” and easy and quick to cook. The flavor is described as nutty-tasting and offers a healthy dose of fiber. Quinoa is the only plant food that is a complete protein, providing 9 essential amino acids. Other gluten-free foods traditional of the Caribbean are tamales (unfilled), corn, yuca bread and many others. Because flavors vary from country to country, the range of tastes and textures found across the region’s fruits and vegetables can transform a limiting diet into a wonderful gastronomic experience. Visit our website at www.micfood.com to learn more about tropical products. Check out our recipes page for ideas and more!